A cash in on Saturday Night Fever with a title that rips of the Italian title of Grease or Brillantina. 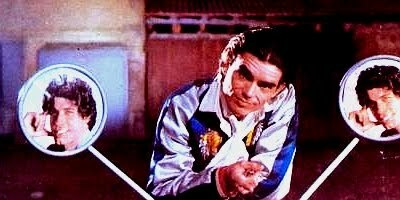 Monty Ray Garrison swishes from scene to scene in the most clunky and awkward fashion and takes part in disco dance offs against a rival gang that resemble the nihilists from The Big Lebowski. The songs are not especially memorable and the dancing is so manic and over the top as to unintentionally provoke laughter but this Michele Massimo Tarantini directed fluff will win over many through sheer persistence. Many of the moves appear to be lifted straight from the Grease big dance contest and Mauro Frittella woop woops in the sort of way Danny Zuko's Three Stooges inspired sidekicks would. Auretta Gay of Zombi 2 is possibly the best known of a largely anonymous cast. At times jaw dropping this one is a riot and a must see for aficionados of dreadful disco dancing.